Sick sinus syndrome (SSS) is a disease in which the heart's natural pacemaker (sinoatrial node) located in the upper right heart chamber (right atrium) becomes damaged. It is no longer able to generate normal heartbeats at the normal rate. It may be a result of other health conditions that damage the sinoatrial node (SA node) over time or may be a result of certain medicines. This can result in heartbeats that are too slow or too fast, or heartbeats that alternate between slow and fast. Sick sinus syndrome is also sometimes called tachy-brady syndrome. Inflammatory conditions that involve the heart. These include rheumatic fever, Chagas disease, pericarditis, and myocarditis. Hypothyroidism, hypothermia, and electrolyte problems generally can be reversed. Who is at risk for sick sinus syndrome? Sick sinus syndrome affects men and women equally, and can occur at any age. But most cases of SSS occur in people over age 70. This is because aging tends to slow the heart rate and lower SA node function. You are also at greater risk of you take medicines such as beta blockers, calcium channel blockers, or digoxin, or medicines to treat arrhythmias. Your healthcare provider may suspect sick sinus syndrome based on your symptoms, but they are common in many other diseases. To diagnose your condition, your healthcare provider will do an electrocardiogram (ECG). This is a machine that records your heart's rate and rhythm. If you don't have symptoms at the time of your ECG, it may look normal. 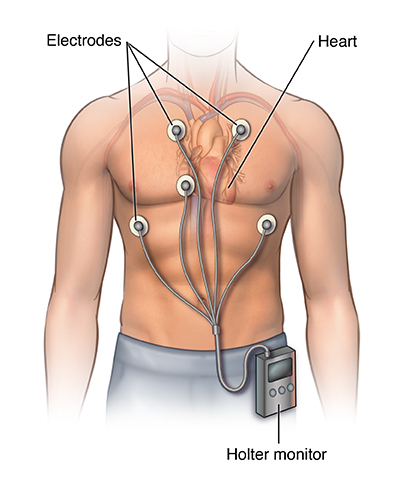 A Holter monitor. This is a recorder you wear for over 24 hours that takes an ECG. An event recorder. This is a recorder you wear over several days that samples your heart rate. An implantable loop recorder. This is a small heart recorder put underneath the skin over the heart. It records the heart rhythm for up to 3 years. Electrophysiologic testing. This is a hospital test that involves threading catheters into your heart through a vein in your thigh. Pacemaker. 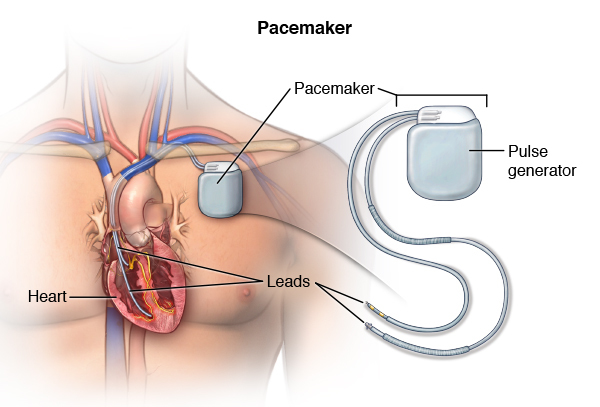 The most common treatment for people with symptoms that don't have a cause that can be reversed is a pacemaker. This is a small, battery-powered device that takes the place of your SA node and regulates your heart rate. A doctor places a pacemaker under the skin of your chest during minor surgery. Wires are put in the heart that can monitor the heart rate and stimulate the heartbeat when needed. What are the possible complications of sick sinus syndrome? Cardiac blood flow may be impaired. This can lead to other organ damage such as brain and kidney function. Sick sinus syndrome is a slow heart rate that can also alternate with fast heart rates. You may have no symptoms or you may have dizziness, fainting, shortness of breath, or fatigue. Sick sinus syndrome may be treated by changing your medicines, treating underlying health conditions, or inserting a pacemaker. Not smoking, keeping your cholesterol and blood pressure under control, eating a healthy diet, maintaining a healthy weight, and getting regular exercise can help reduce the risk for sick sinus syndrome.